Philosophy of Physics: Quantum Theory, by Tim Maudlin. Princeton University Press, 2019. 234 pages. 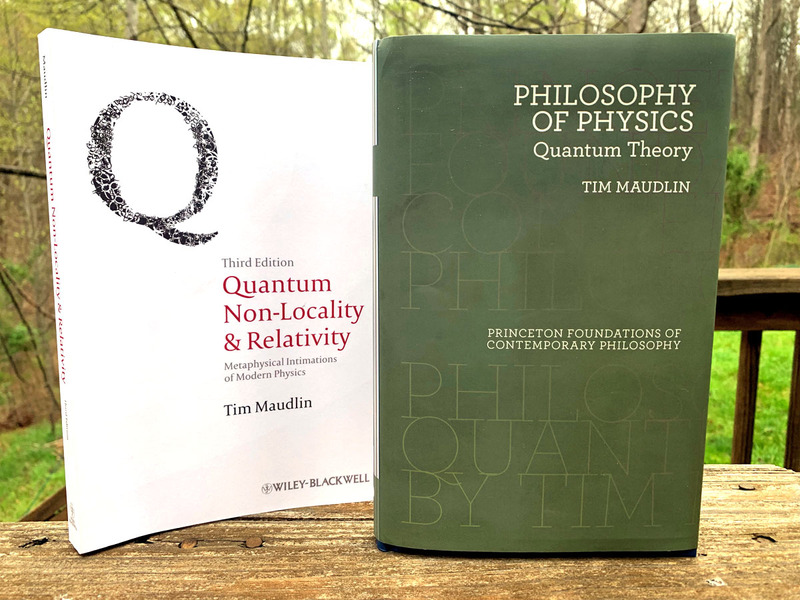 Quantum Non-Locality and Relativity: Metaphysical Intimations of Modern Physics (third edition), by Tim Maudlin. Wiley-Blackwell, 2011. 298 pages. Actually, academic philosophy has a word for humans as organic robots. That word is zombie. You can read the article on zombies here in the Stanford Encyclopedia of Philosophy. The zombie concept (as much as I detest zombie movies) is a useful concept in thinking about what it means to be a conscious, not to mention a decent, human being. If we are not zombies, then what is it in us that makes us something else? It happened that I had just finished laboring my way through these two books when I came across John Twelve Hawks’ comment. I cannot follow most of the math of relativity and quantum theory. But I do think that I have a tenuous grasp of the gist of it. I have read a lot of books like this, and I imagine that John Twelve Hawks has, too (as would any science fiction writer who is worth the ink). If John Twelve Hawks was troubled by the suggestion that there is no such thing as objective reality, I was horrified. We are living in an era in which many people feel that they are entitled to their own facts and their own reality. Do we really need to embolden fools with the notion that cutting-edge physics is on their side? On what grounds does Tim Maudlin say that objective reality is safe and sound? To answer that question, you’ve got a lot of reading ahead of you. Modern physics is so strange that many physicists actually believe that all possible futures are real, and that a whole new and slightly different universe is created every time some tiny particle undergoes “quantum decoherence.” This is called the Many Worlds Interpretation. Maudlin thinks that’s bunk. For what it’s worth, I do, too. I would say that the reason the minds of many physicists are drawn to the Many Worlds Interpretation (MWI) is that MWI returns physics to a kind of determinism. The alternative to determinism is spooky, and they don’t like spooks. It was Einstein, I think, who first used the phrase “spooky action at a distance.” For what it’s worth, I like the idea of a spooky universe. I am by no means qualified to actually review these books. But I do want to argue that, when these mysteries in physics are eventually resolved, it will be the most important new knowledge in our lifetime (if we are lucky and it happens in our lifetime). If Quantum Non-Locality and Relativity could be boiled down to one key point, I would say that it’s this: Spooky action at a distance is real. Get over it. Philosophy of Physics: Quantum Theory is a survey of current candidates for a grand unification theory that can reconcile the contradictions between relativity theory and quantum theory. We seem to not be getting any closer, really. (And I’m not getting any younger.) These theories are largely incompatible. Physicists and philosophers of physics are polite to each other in their books. But online they can be a bit snarky about theories they disagree with. But you don’t have to be a physicist or a philosopher of physics to choose sides and root for the spooks. You could even come up with your own theory, though you’d have to provide the math to support it. That there is nothing here is by no means a new idea. In Eastern philosophy, as John Twelve Hawks would know, it is called maya, a kind of light-and-magic show. But that cannot mean that anything goes. Yes, the spookiness seems to be real. But nevertheless the universe remains strictly governed by its mathematics. Much of that math physicists already know. But the biggest piece remains elusive. As for maya, I am not very interested in what ancient philosophy says on the matter. They didn’t provide any supporting math. I only want to know what physicists ultimately figure out. This was written by daltoni. Posted on Monday, April 8, 2019, at 11:29 am. Filed under Culture, Literature. Bookmark the permalink. Follow comments here with the RSS feed. Trackbacks are closed, but you can post a comment. The idea that consciousness underpins all reality is an intriguing idea though.There is a guy called Swami Sarvapriyananda whose you tube lectures are excellent. He seems to take a very rational, down-to-earth approach to his teachings and seeks to reconcile them with science. He did though make an interesting criticism in one of his interviews that these ideas have led at times to an overly detached view of life. Suffering and injustice was ultimately not real, just illusory, therefore we should not be troubled by it. Hi Chenda… Yes. As you point out, there is intriguing evidence that consciousness is somehow involved in quantum behavior and that physics must take consciousness into account. There are those who embrace that idea, and there are those who are afraid of spooks who resist it. 🙂 I like the idea of consciousness somehow being entangled (sorry for the pun) with the laws of nature. That’s one reason why I am so fascinated by the Penrose-Hameroff theory on the physics and physiology of consciousness … too much, of course, to try to go into here. You are right about the meaning of suffering and injustice. I would argue that that’s the dark side of Hindu culture. When you add the idea of maya to the idea of karma, you end up with a culture in which those at the top can hardly even perceive, let alone care about or work to alleviate, the suffering of those at the bottom. And those at the bottom are taught to blame themselves.